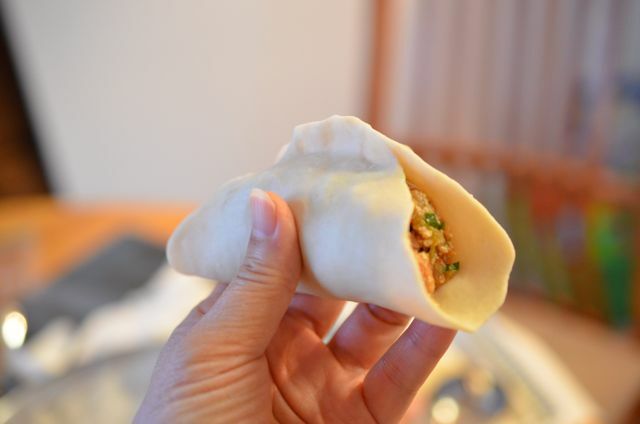 Mandu 만두 shared here are Korean dumplings made with lots of kimchi in the filling. 왕만두 (wang mandu) – ‘wang’ means king in Korean and it basically means it’s a king-size mandu. With the Korean New Year holiday (설날 Seollal) around the corner, I had a craving for these home made North Korean style kimchi mandu (dumplings). And I don’t mean just semi-home made dumplings that use ready made, store-bought mandu wrappers.. I wanted to eat the ones that were made with home made dough. Once you have tasted these, you will want to have these again and again..I am kind of sad that these days, very few Koreans make mandu at home like our parents used to when I was little. So.. although my post will be long, I hope you will bear with me and also hope that some of you will even find time to make them at home while enjoying the slow process. 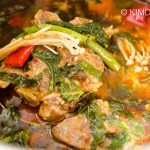 The recipe I introduce here uses a combination of pork and beef. 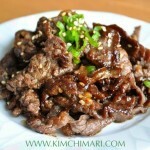 You can adjust the amount of the meat (all beef, all pork, etc) and kimchi to your taste. 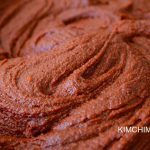 To make a vegan kimchi dumpling, omit meat and substitute with more tofu (4 oz additional) and add 4 oz chopped shitake mushrooms. Keep the dough covered with a wet towel and let it sit for 30 min to 1 hour. Start boiling 4 C of water to cook sprouts in. 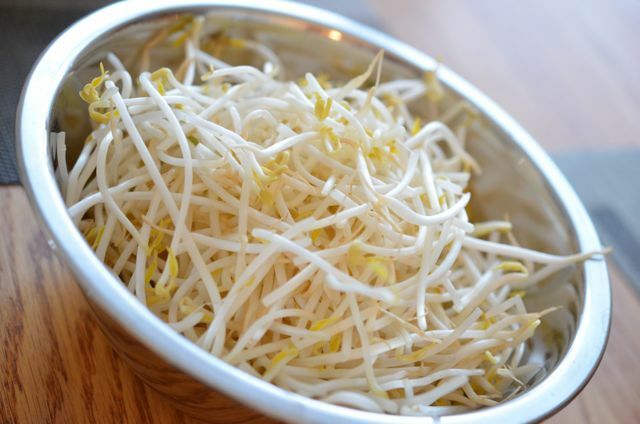 Rinse bean sprouts and cook in boiling water. When water comes back to boil after adding the sprouts, turn off heat. 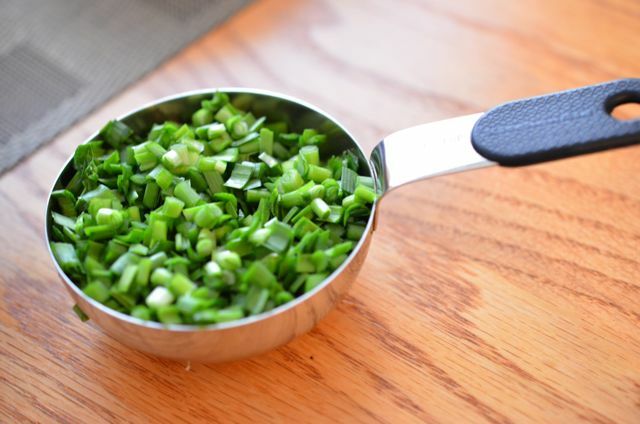 Drain and rinse sprouts in cold water to stop it from cooking further. 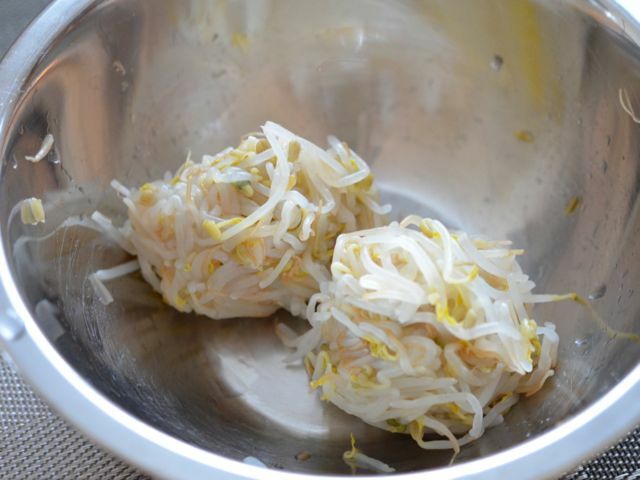 Take a handful of cooked sprouts and gently remove excess water by squeezing them into a ball. No need to squeeze too hard but just enough so that they look something like this. Rough chop cooked sprouts into 1/2 in long pieces. Season chopped sprouts with 1/2 tsp sesame oil and 1/8 tsp salt. Chop cabbage kimchi. 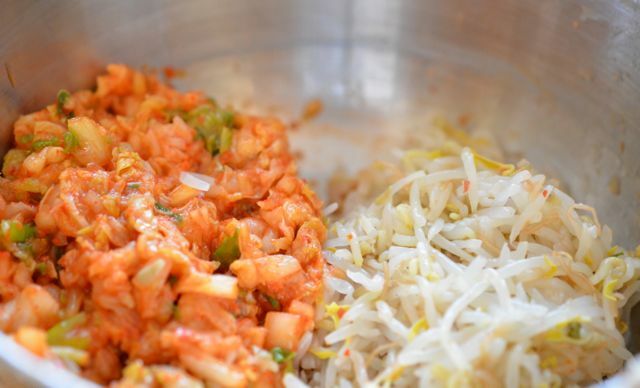 If using a 포기김치 (pogi kimchi), remove extra seasoning (양념 yangnyeom) from the cabbage to make it less spicy and salty. You can even rinse the kimchi in water if you want a milder taste. 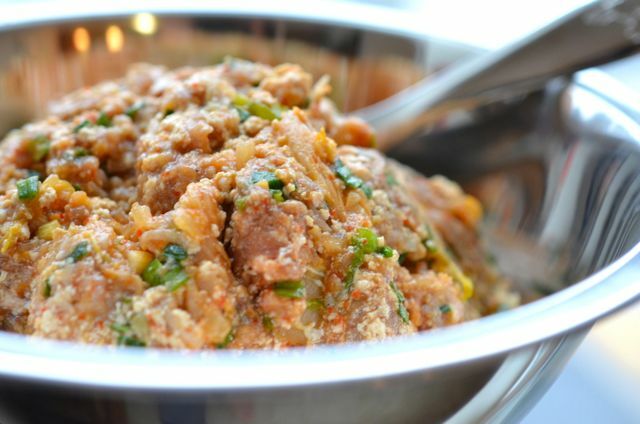 Combine both ground meats and season altogether with 1 tsp each of soy sauce, chopped garlic, ginger. Add 1/2 tsp salt and few dashes of pepper. Mix well. Season tofu crumbles with 1/2 tsp sesame oil and 1/4 tsp salt. Chop a handful of Korean chives like so. Mix meat, bean sprouts, kimchi, tofu and chives altogether. Divide and shape the dough into walnut size (1.5 inch) balls. Roll out each piece of dough to about 4 in rounds. I did not have a rolling pin so I used a glass bottle which is exactly what my mom used. And it worked just fine! Here’s a comparison picture of my home made mandu wrapper on the left and a store bought one on the right. Now, we are finally ready to put it altogther!!! Take the wrapper and put it on your palm. And then take about 2 heaping spoonfuls of the stuffing and put it at the center of the wrapper. The amount of stuffing should feel like it’s too much for the wrapper. 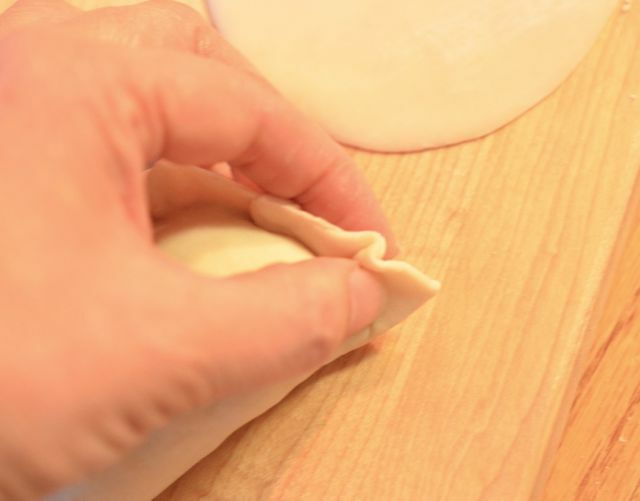 Start sealing the dumpling by pinching the center edges. 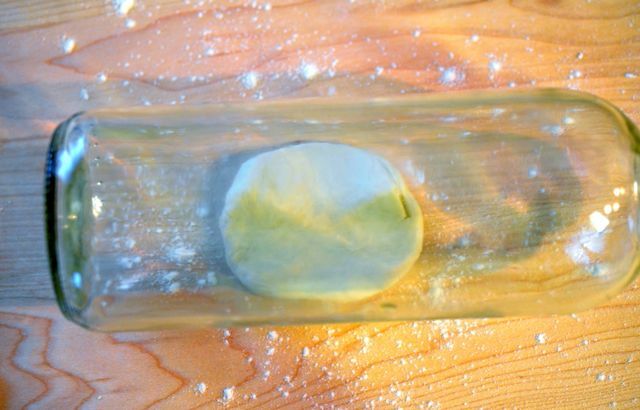 Since you are making with fresh dough, there’s no need to use water or egg whites to help the edges seal. Seal off the rest by pinching remaining sides. Here is how it looks when dumpling is all closed up! Sprinkle flour on a tray and lay them on it, without touching each other. Time to COOK!!! You can either cook it in boiling water for 10-15 min until it floats to the top or steam it in a steamer for 10-15 min or add it to a beef broth for manduguk. 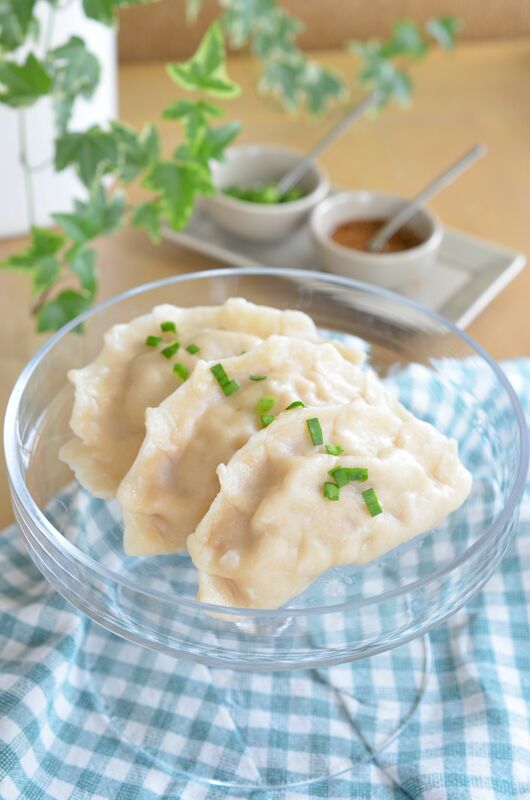 Personally, I think boiled dumplings maintain the chewiness of the wrapper skin the best without the edges drying out, which can happen with steaming sometimes. BTW, if you are wondering how I added the pleated designs into the mandu – here’s how. Just fold the edge once like so and repeat every couple centimeters or 1/2 inch or so. 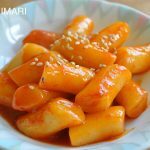 This North Korean style Kimchi Mandu or also called 이북식 만두 (Yibukshik Mandu) are what I grew up eating and making at home. 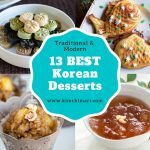 Filled with kimchi, pork, beef, tofu and bean sprouts - it's a delicious treat for special holidays for Koreans. 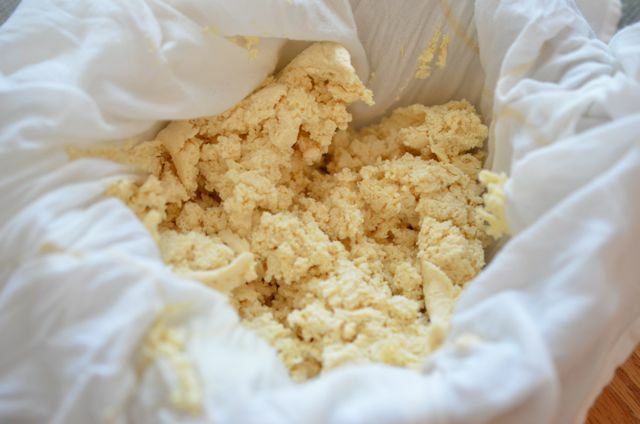 Make dough by mixing 3 C flour, 2 tsp salt, 3/4 C water and 1 T vegetable oil. Add 1~ 2 T water depending on how your dough comes out. Knead for few minutes until the dough looks even throughout. It should not be so wet that it sticks to your hands but not so dry that you see dry spots in the dough. 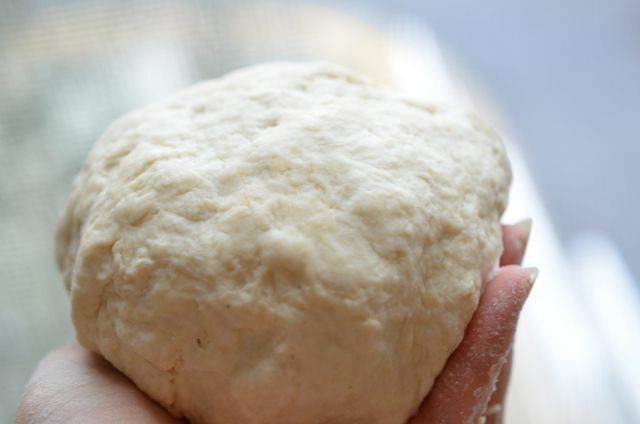 Keep dough covered with a wet towel and let it sit for 30 min to 1 hour. Take a handful of cooked sprouts and gently remove excess water by squeezing them into a ball. Season ground pork and beef altogether with 1 tsp each of soy sauce, chopped garlic, ginger. Add 1/2 tsp salt and few dashes of pepper. Mix well. 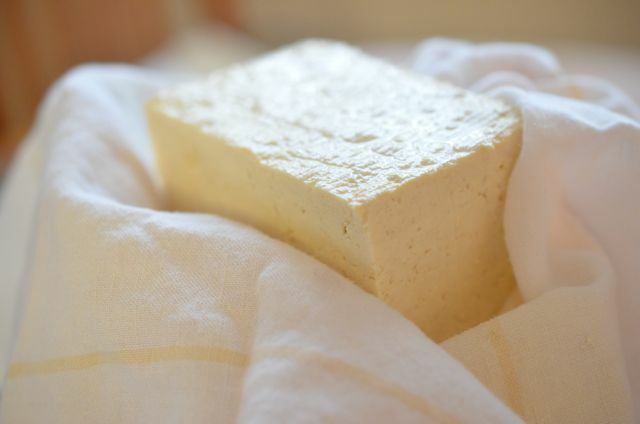 For tofu, use a cheese cloth to squeeze excess water. Chop a handful of Korean chives. 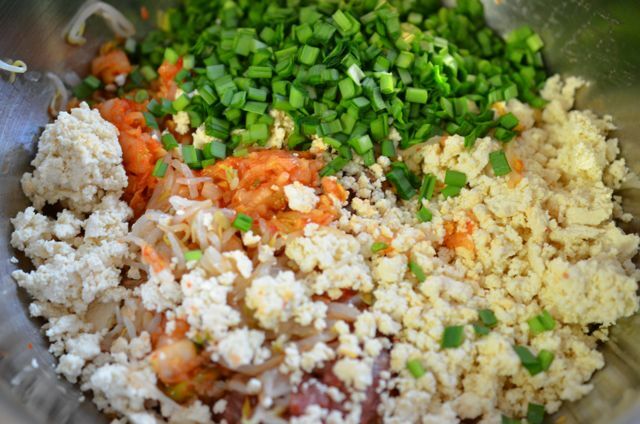 Mix meat, bean sprouts, kimchi, tofu and chives altogether. Set aside to use as stuffing. Divide and shape dough into walnut size (1.5 inch) balls. Now, we are finally ready to put it altogther!!! Take the wrapper and put it on your palm. And then take a spoonful of stuffing and put it at the center of the wrapper. The amount of stuffing should feel like it's too much for the wrapper. 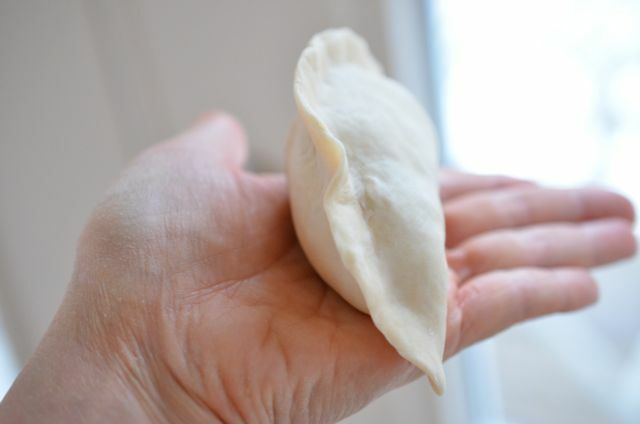 Start sealing the dumpling by pinching the center edges. 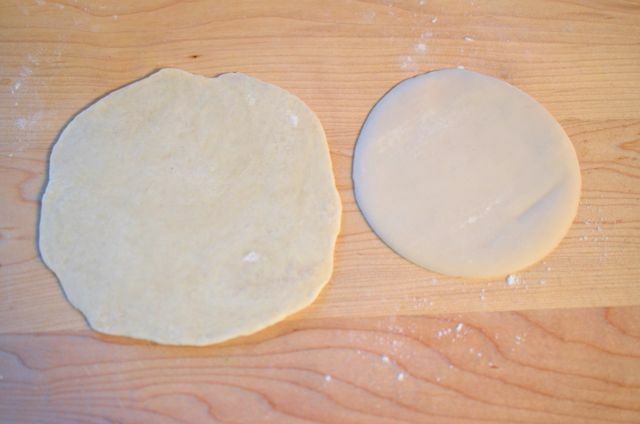 Since you are making with fresh dough, there's no need to use water or egg whites to help the edges seal. Time to COOK!!! You can either cook it in boiling water for 10-15 min until it floats to the top or steam it in a steamer for 10-15 min or add it to a beef broth for manduguk. 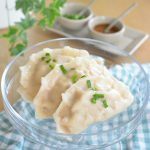 Leftover uncooked dumplings can be frozen for later use. 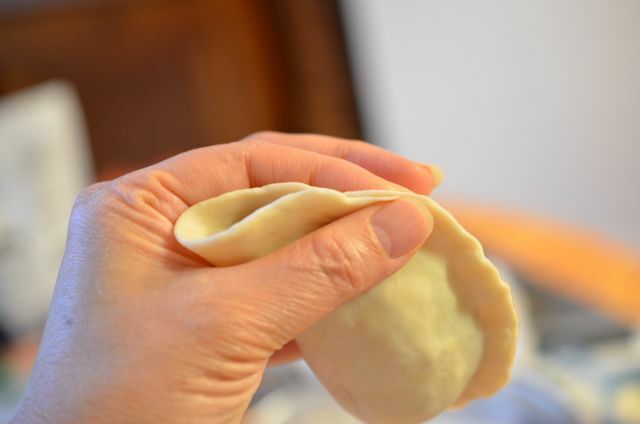 In order to avoid the dumplings from sticking to each other, you need to first freeze briefly uncovered on a tray (see pic in step 8) until they feel hard on the outside. Once the outside is frozen hard, you can then put them altogether in a freezer bag and freeze for later use. 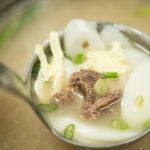 Finally, some restaurant recommendations which serve this kind of Korean dumpling in Seoul – Pildong Myeonok (필동면옥) in Pildong and Jinnampo Myeonok (진남포면옥) in 약수동 are my favorites. These restaurants have been around for generations, started by owners who are originally from North Korea, much like my parents. You don’t have to make the dough, the stuffing and mandu all in one day. You can make the stuffing and/or the dough ahead and keep in the fridge up to 1 day so you can break up the project over 2 days. 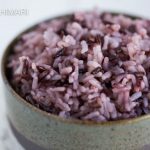 – Thank you to my sis #2 for letting me use her kitchen and dishes for this post !! I’m salivating looking at the photo..and will try this recipe on weekend.. BTW, I like the texture of gyoza (Japanese dumpling)..would this be still ok if I steam fry it just like gyoza to get the crust on the outer skin? Hi Devi, sure you can steam fry to get the crust. 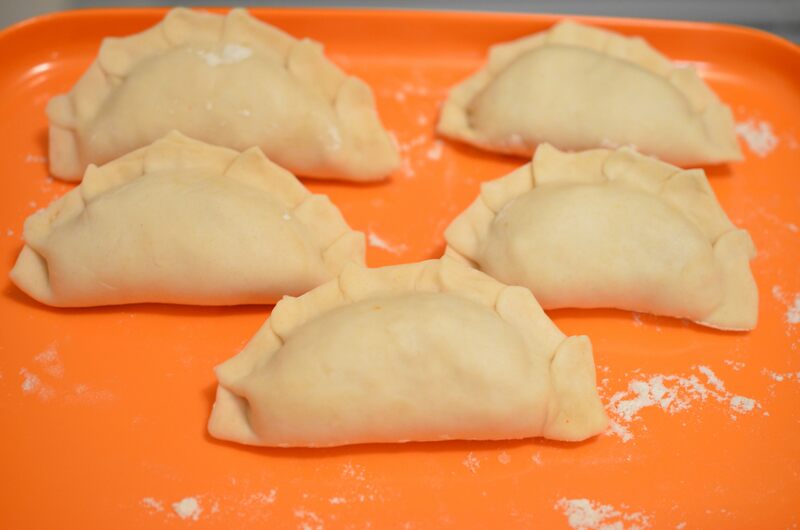 And because you will be making the dough, it should come out nice and thick like gyoza. Good luck and enjoy! Yes, you can substitute chicken. The difference is not that they are Korean or not, it is the firmness that matters and what you need for dumplings is EXTRA FIRM tofu. Silk tofu is too soft and silky. 🙂 You can learn all about tofu in my https://kimchimari.com/easy-tofu-recipe-broccoli-dubu-muchim/ post. Thanks for asking! Hi! One of the things I miss the most is Mandu since being diagnosed celiac. 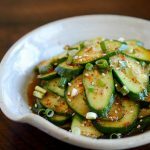 Do you have any recipe suggestions or know of any pre-prepared GF brands of mandu? I always check my korean grocery store without success. Thanks! Hi! Sure, I know it’s not easy to find gluten free mandu. I have actually not tried to make gluten free manu wrapper myself ( I should huh..?) but I’m thinking that you could use gluten free flour for bread and start from there. Cup4Cup makes great gluten free flour that you can usually substitute cup for cup in any recipe. So I would try getting Cup4Cup flour for pizza or bread and then try making wrapper with that. For pre-prepared mandu, Pulmuone is always my preferred brand and they do have a couple mandu that is GF. has rice+sweet rice flour wrappers or sweet rice+potato flour wrapper mandu. There’s pulmuone 방울만두 that has sweet rice+potato flour wrapper (0% flour) and there’s 쌀물만두 that may be GF. Problem is, these may only be available in Korea and not in US. Not sure where you live though…I will have to try making some GF dough and post. Another idea I’m thinking is that try searching for shumai recipes – their wrapper dough is usually made with rice flour I think. 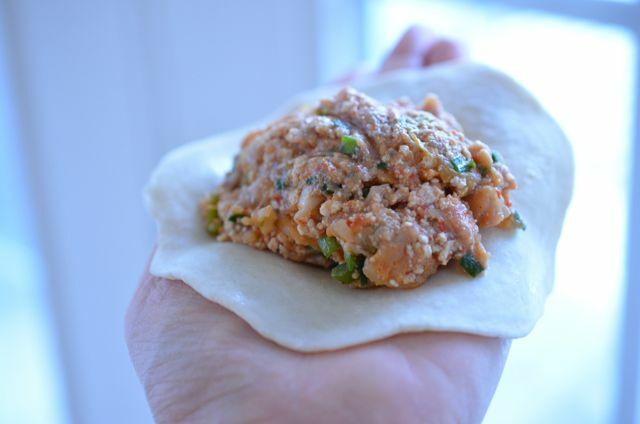 You could use my kimchi dumpling stuffing and use that wrapper dough. Good luck!!! And please check back every now and then because I may have a GF dough recipe up on my blog. Chef is adding some more handmade mandu to our new menu and I can say that the multiple trials we had to find the best recipe were… very tasty! HI Cindy!! 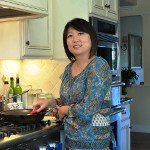 Soo good to hear from you~ and very cool that you are adding handmade mandu to your menu. 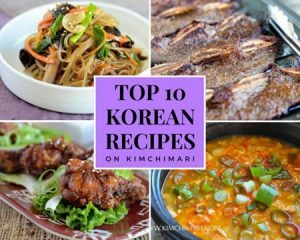 My recipe is quite loaded on Kimchi but for your guests, they may like a little more meat and less Kimchi?? But then what do I know about the flavors people like over there. I’m sure your Chef has the perfect recipe for your restaurant. I hope to visit London and visit your restaurant someday…Take care! Looks really tasty! MUST TRY! This looks yummy, I hope to make it someday. I really hope you get to make it soon~thank you! Ah. you have been reading my mind! Since I don’t have any family that will celebrate Korean holidays with me, I usually spend the day cooking something that I wouldn’t normally make. Just a week ago I got ready to transfer my meat grinder to son and daughter-in-law, but I thought, no, let’s wait – I want to make mandoo. Now to find a recipe! And here it is, served on a plate for me! Thank you! BTW, I have got a restaurant lined up – it’s available on Mondays – with a spacious kitchen and fun dining area that will be perfect for cooking classes. Drop me a line when you are interested. Hi Judy!! Yay!!! I had a hard time deciding what to post and soo happy to hear it’s what you needed. Thank you so much for even having a restaurant lined up!!! I will be traveling back to Korea one last time (for a while anyway) for month of feb but will LOVE to teach classes after I get back! Will keep in touch! HI Judy! How are you doing? I think I am now finally settled into my old/new home. :)) So…do you still want to talk about cooking classes? I am all ears!! 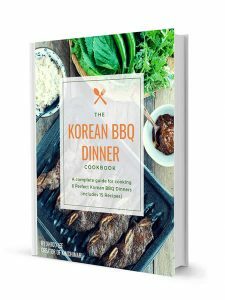 – you can contact me via FOLLOW ME link or directly to my email jinjoofood@gmail.com! Looks yummie. Thanks for the tutorial. I have only made mandu with ready made wrappers but I want to try making my own one day ???? Just another question, do you prepare all the mandu skins in advance or one at the time (ie make skin, filling, make skin, filling etc)? If you roll out all the skins in advance, how do you keep them from stickibg together or drying out? When I did mine, I did one at a time. But you can certainly make them in advance, even freeze them. To prevent them from sticking together, dust each side with flour. Once they are rolled out (and cut out or shaped) and dusted, you can stack them up, wrap them with plastic wrap + plastic bag and freeze them. Best not to leave out the finished wrappers uncovered since they will dry up. Always use lightly moistened towel/paper towel to cover them up if you are not going to use them right away. Hope this helps! !